Dr. John Calhoun joined Idaho Veterinary Hospital in 1990 when it was still a mixed animal hospital serving both large and small animals. The hospital has been small animal exclusive for over 15 years. Dr. Calhoun has enjoyed watching the practice and the city of Nampa change and grow throughout his time here. Dr. Calhoun dreamed of becoming a Veterinarian at the young age of ten years old. This dream persisted as he grew and led him to pursue the occupation through University of Pennsylvania’s Veterinary Medical School. After twenty years as a veterinarian he still enjoys what he does. He has developed a strong interest in orthopedic surgery, exotic animal medicine, and reproductive medicine.Outside of work he enjoys his family and spending time outdoors. During warm weather his passions are hiking, bicycling, and some gardening. In the winter he can often be found on the ice hockey rink. Dr. Calhoun’s favorite animal is the Sea Turtle: they’re graceful, inquisitive, and take life at a slow pace. Dr. Samantha Cavender joined our team in May, 2013. She grew up involved in raising sheep, goats, cattle, and horses. She knew she wanted to become a veterinarian at a young age. That desire continued to grow with her involvement in 4-H and FFA. Through Colorado State University’s School of Veterinary Medicine, that aspiration became a reality in 2010. She enjoys working with IVH’s great clients and loveable pets. She also appreciates that she has the opportunity to practice and offer a higher level, and standard, of medicine. When she isn’t at work she enjoys spending her time outdoors: riding horses, biking, boating, hiking, and “glamping” (that is luxury camping as she calls it). She also enjoys spending time with her husband Brian, her family, and her two Aussies, Switch and Millie. Dr. Cavender’s favorite animals are sheep and goats. She says “someone has to love the cute buggers, might as well be her”. Dr. Jennifer Pearson, DVM joined IVH full time in January of 2015, after helping us out as a relief veterinarian for the past year. Prior to joining us, she practiced Emergency Veterinary Medicine at West Vet. 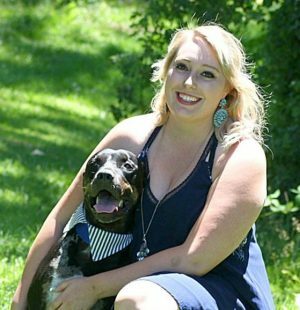 Dr. Pearson’s love of animals and desire to have a career that would never be boring drove her to pursue a degree in Veterinary Medicine, and she graduated from Kansas State University in 2005. 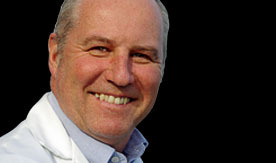 Dr. Pearson enjoys the challenge of treating patients in emergency situations and caring for critical cases. Outside of work she is often found outdoors, running, hiking or camping with her husband, Scott. At home, she has two cats, and two adorable Golden Retrievers, “Charlotte” and “Busy”. Dr. Pearson’s favorite animal is the Sea Otter; They’re just so darn cute! Dr. Rebecca Hopwood joined our team in January 2018. She grew up on a dairy farm in northwestern Pennsylvania where she watched her uncle perform veterinary work. It was in this environment that she developed an interest in veterinary medicine. She earned her DVM through Kansas State University, graduating in 2014. She is excited about working with the amazing team at Idaho Veterinary Hospital who are passionate and excited about providing great service and excellent medical care.The opportunity to see complex cases and perform advanced surgery and medicine was a major factor in her decision to join the IVH team. Outside of work Dr. Hopwood enjoys creating delicious baked goods for her husband, Chris, and hiking and exploring God’s beautiful creation. Though she doesn’t have any animals of her own right now, her favorite animal is the mongoose because they are fearless. 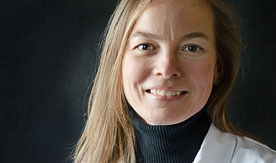 Dr. Ann Mueller started with our team in the Fall of 2018 working as a relief veterinarian. A native Idahoan, she grew up with horses, cows, chickens, sheep and goats. At a young age, science fascinated her. Becoming a veterinarian seemed like the best option to combine her love of science and animals. 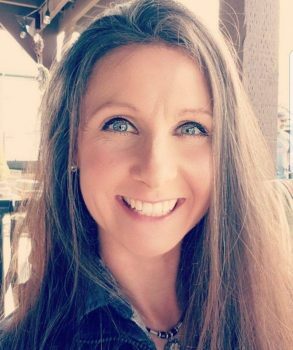 Dr. Mueller graduated from University of Idaho with a Masters of Veterinary Science in 2006 and Washington State University with a Doctorate of Veterinary Medicine in 2012. Dr. Mueller lives in Caldwell with her husband and their three girls. She and her family enjoy adventuring in the great outdoors—camping, 4-wheeling, fishing (with or without ice), hunting and hiking. Her indoor interests include yoga, sewing and cooking. Dr. Dean Lavallee joined our team in December, 2018. He grew up with a profound fascination with animals, to include how they work and function, inside and out! He decided at an early age that veterinary medicine was the only career for him and attended Colorado State University’s School of Veterinary Medicine. Dr. Lavallee is overjoyed to be working with Idaho Veterinary Hospital’s amazing team and our incredible clients and their pets. Outside of work he enjoys running, yoga, hiking, fishing, traveling, and spending time with his children. 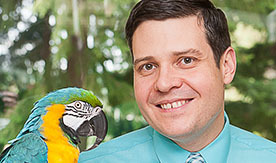 Dr. Lavallee has always had a soft spot in his heart for birds, and his favorite of all is his blue and gold macaw, Pancho, his loyal companion for 23 years. His dog, Chewie, is of course a close second. Bridget joined our team in 2007. 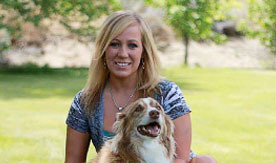 She is our Reproduction specialist here at Idaho Veterinary Hospital. Her love of helping animals brought her to IVH and she enjoys working with them everyday. Her favorite aspect of her job is how working with the IVH staff is like belonging to a family; everyone is dedicated to helping clients and their animals. 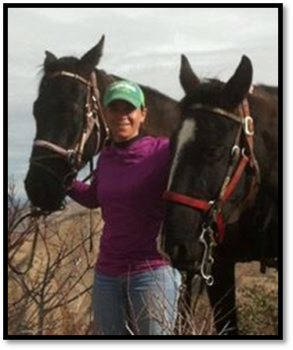 Outside of work Bridget enjoys horseback riding; especially on field trails and hunting. Her favorite animals are horses and dogs. Kate joined our team in 2008. As a child she set her mind on the veterinary field and often doctored or raise any animals she could find. At IVH she started out volunteering; helping the technician staff. Although she is our manager, she is often found helping with avian and reproductive services. She loves being around animals and interacting with clients and pets. She enjoys the variety of animals she gets to see each day. Outside of work, Kate enjoys spending time with her family, dog, and birds. Falconry has been a cornerstone in her life, as she has been practicing it from her first steps. Her favorite animal is, of course, the falcon. 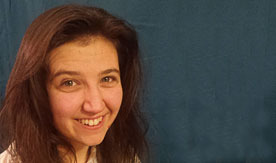 Roni joined IVH in January of 2013. Roni has developed a strong interest in canine and feline nutrition, and has become our practice’s nutrition coach. Her favorite part of working here is that she loves helping pets and their owners learn new things. 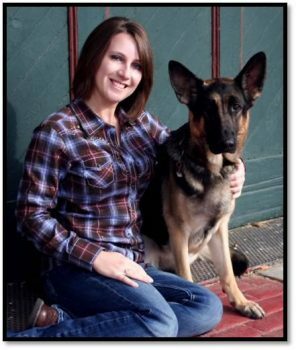 Outside of work, Roni loves showing and training her German Shepherds, as well as spending time with family, hiking, camping, fishing and sports. Her favorite animals are Dogs and Horses. Jen began working with IVH’s Reception team in 2014 and then became one of our wonderful Exam Room Technicians in 2017. She loves seeing the different personalities of every pet that comes in, and all of the new things she learns every day! Her favorite animal is the German Shepherd; they are beautiful, loyal and strong. Outside of work, Jen enjoys camping, snowboarding, taking road trips and relaxing with friends and family! “D” joined the technician team in 2014 after graduating from college. She has always wanted to help animals and even as a child would play vet. “D” loves every part of her career, especially when she can change a patient’s life with a little help. She plans on continuing her education with hopes of working for the Fish and Game in the future. Outside of work, “D” enjoys hunting, fishing and camping, or staying home and taking care of her dogs “Taz” and “Onyx” and her many reptiles. “D” has a hard time choosing a favorite animal, because she loves them all, but she does have a soft spot for dogs, savannah monitors, bearded dragons, tortoises and geckos! Alyssa joined Idaho Vet in 2015 after completing her externship as a Certified Veterinary Technician from Broadway University. 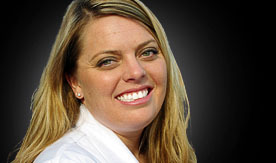 Alyssa has become one of our go-to experts on exotic medicine and surgical procedures. She has always been interested in medicine, and fell in love with being surrounded by animals after working on a ranch in high school. After that, veterinary medicine was a natural choice. 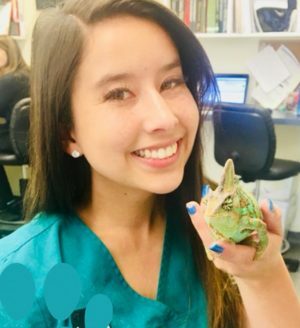 Alyssa enjoys the variety of patients we see on a daily basis; swans, hamsters, tree frogs, birds of prey, reptiles, and of course cats and dogs! The most rewarding part of her career is working with doctors to get patients back to 100% and seeing the animal’s excitement to see their family. Alyssa’s favorite animal is the cow, and of course her Catahoula Leopard Dog, “Tipsy”. Kendall joined the IVH team in 2014 as a Receptionist and is now our Financial Manager. This career is a good fit for her, she enjoys interacting with all the different species we see, as well as talking to the awesome clients and working with an amazing team. Outside of work, Kendall enjoys spending time with her dog, a German Shepherd named “Troy” and her husband, Mark. She also likes to workout and spend time with her family and friends. Her favorite animals are Dogs and Penguins. Jillian joined the IVH team in 2015 and is our Lead Technician and Technician Manager, as well as in integral part of our Canine Reproduction Team. 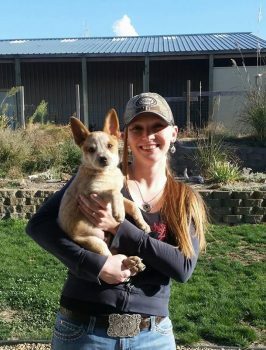 She has been involved in the veterinary field since 2009, starting as a kennel attendant in Texas and working her way up to a veterinary technician. Her obvious love for animals started her on this path, but as she says, “The ability to help patients and their ‘mom’ and ‘dad’ is what keeps me in the field”. Jillian enjoys the interaction with all of our clients and their fur babies. 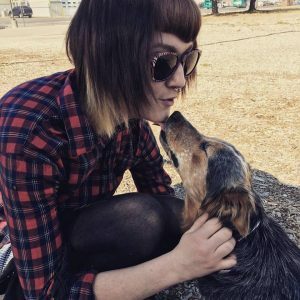 Jillian shares her home with 3 dogs,”Goat” the Goldendoodle, “Scout” the Aussie and “Ally” the Golden Retriever, as well as “L.E.” and “Pockets” the kitties. She also enjoys spending time with her two thoroughbreds, “Finnie” and “Lady”. Sabine joined the IVH team originally in 2006 and after a brief hiatus joined us again in fall of 2017. 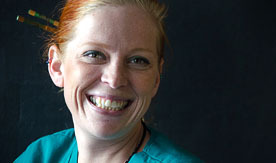 She has become one of our dedicated Surgical Technicians, specializing in anesthesia and dental procedures. 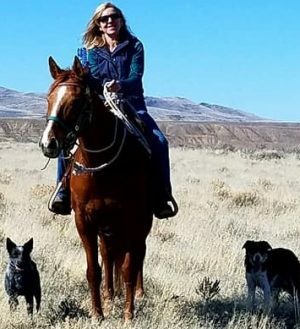 In her time away from work, Sabine loves exploring the great outdoors on her horse, Gigi, with her two dedicated dogs, “Tatonka” the heeler and “Levi” the border collie, who both love to join her on the occasional cattle drives. When Sabine has a few moments to rest at home, she enjoys the company of her husband Rick, and feline friends, “Silky”, ‘George” “Macy” and “Sammie”. Janet joined Idaho Veterinary Hospital’s Front staff in January of 2016. This is an exciting career change for her, being able to work with animals and their owners is something she loves. Janet and her husband, Glendon, have been married for 22 years and have 3 kids; Jackson, Madison and Raiden. At home, Janet has her hands full with her Shih Tzu “Zowie” and her cat “Twilight”. Zowie is very playful and loving, definitely the baby of the family, and just a bit spoiled! 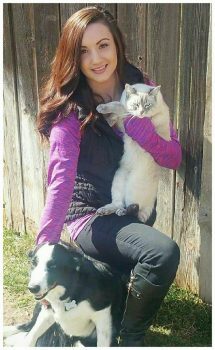 Jessica joined Idaho Veterinary Hospital as a Front Office Representative in March of 2017! She is drawn to the veterinary field by her love of all animals, especially her own, and a deep interest in the medical field. 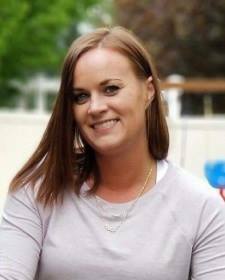 While she loves working around all the cute and fascinating animals every day, her primary goals are to grow in the Idaho Vet family and gain as much knowledge as possible. You can call Jessica our ‘cat lady’; felines are definitely her favorite animal. She has always felt at peace while cuddling a sweet kitty. Her cat, ‘Tora’, is a sweet and sassy kitty, always keeping her on her toes, along with her border collie, ‘Tuff’. 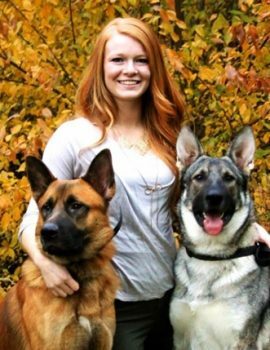 Katy joined Idaho Vet as a Vet Tech in 2016. She was drawn to the veterinary field after a life-long love of animals and learning about them. This is the perfect career for her because she can spend an abundance of time with a variety of animals and provide help when they most need it. She is a true advocate for the animals! While she is here she hopes to expand her knowledge on the many different types of exotic critters we see and also continuing her education on such things as surgeries (they’re her favorite!)! Over the next year, Katy’s goal is to complete her Certification in Veterinary Technology. She can’t pick just one favorite animal, but mostly includes felines; both wild and domestic! She has 3 cats herself, Butters, Dougie and Marceline, and of course don’t forget the dog, “Zelda”. 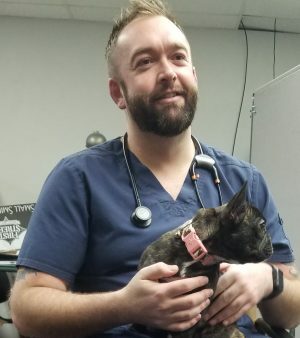 Jesse joined Idaho Veterinary Hospital in 2018 as an exam room technician after many years in the pet-supply field. Since a very young age, she has loved animals and had a calling to help them in their time of need. Educating owners on their pet’s needs and witnessing their pet flourishing is incredibly rewarding for her. In her time at IVH, she hopes to be a welcoming face to both owners and patients and to help them feel as comfortable and happy as possible while visiting us. She is looking forward to expanding her skill set and learning from & working with our amazing staff. Outside of work, Jesse enjoys horseback riding, with the Quarter Horse being her favorite animal with their diversified abilities. 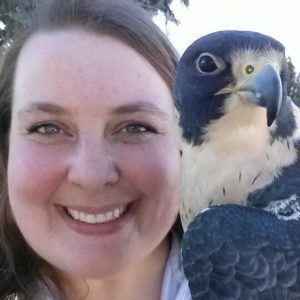 Jesse has many animals of her own, including 2 dogs, “Buckey” & “Rowdy”, “Mufasa” the Ragdoll, “Muffin” & “Ducky” the parrots, “Binx” the Skink, 2 mares “Ginger” & “Otawna”, and of course her chickens! Elizabeth joined the Idaho Veterinary Hospital team in January of 2018 after relocating to Idaho from South Carolina. Her passion for helping animals and being an advocate for their care has made her the perfect Surgical Scrub Nurse. Her duties include pampering our procedure patients before and after their procedures and making certain that our surgical equipment is kept in top notch condition. 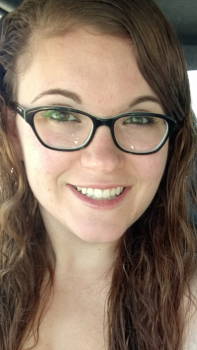 Elizabeth is looking forward to continuing her education in our field, especially in the areas of dental procedures and surgeries; as well as Exotic Animal husbandry. Eventually, she would love to become a certified Vet Tech. Outside of work, Elizabeth’s goal is to obtain the ideal place to be able to take in rescues of all species; She’s never met an animal that she doesn’t love. With that being said, she loves her two dogs, Chili & Nova. and Tennessee Walker, “Delight”, the most. 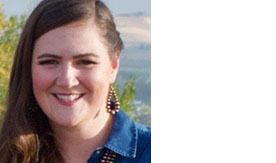 Becca joined the IVH team in the Fall of 2017. As a child, she dreamed of being a veterinarian and played ‘doctor’ with her family pets, nurturing everything, even insects. This taught Becca an equally important role as a technician, which has made her a wonderful advocate for animals that could not speak for themselves. Following this path, she became a Certified Veterinary Technician just over a year ago. She came to IVH because she knew it would be the best place to expand not only her skills but her knowledge of all the different types of animals we see! Becca’s goal is to become the best tech that she can possibly be. She would like to eventually specialize in something such as dentistry, laboratory or anesthesia. Besides her own critters, Muffin, Sable, and Popeye (the one-eyed kitty! ), Becca’s favorite animal is the elephant; They’re big, graceful and live together harmoniously. Chase joined Idaho Veterinary Hospital in February of 2018 as a veterinary technician. Chase has specialized in many things over the years, but is especially knowledgeable in anesthesia, exotics and canine reproduction. He has an amazingly calm demeanor, even in stressful situations, which both our patients and their parents are especially grateful for. During his time at IVH, Chase hopes to expand his knowledge in both the exotics and canine reproduction areas, and impart his knowledge to our staff. Chase has a huge heart, which shows through his love of all animals, especially his French Bulldog, “Piper”. Eryn joined the Idaho Veterinary Hospital team in the summer of 2018 after moving back to Idaho from Oregon. 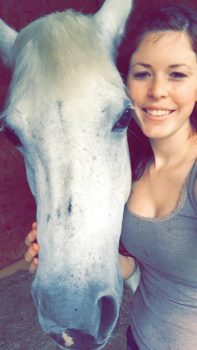 She began exploring the veterinary technician field after enrolling in school for equine podiatry and learning more about treatments and diagnosis of different conditions. While at Idaho Vet, Eyrn is looking forward to learning different aspects she hasn’t experienced yet, such as Canine Reproduction and Radiology. 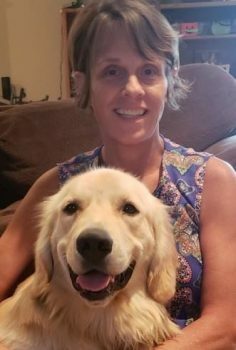 Pam joined the IVH team in the Summer of 2018 as a Certified Veterinary Technician. 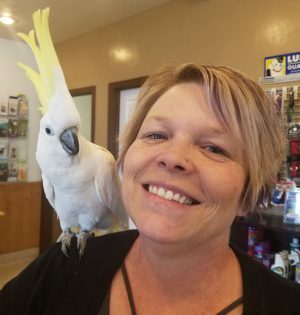 Her love of animals drew her to the field nearly 20 years ago, and her love of educating both young technicians and clients has kept her involved. She also loves the challenge of helping solve a mysterious medical case. Pam enjoys learning new things every day and is looking forward to expanding her knowledge on exotics and the care of chronic conditions. Pam’s goals are to work towards a second technician specialty (she is already certified in emergency medicine!) and to watch her two young daughters grow into successful adults. Pam’s favorite animal is the horse because of the amazing connection they can have to their people. She has 3 dogs at home, 2 goldens, “Gem” and “Jasper” and a chihuahua, “Basil”. Megan joined the Idaho Veterinary Hospital team in the summer of 2018. She has always looked for a career involving animals, and knew as a young girl that is what she wanted to do. As a young girl, she tried to rescue every stray cat she came across. During her time at IVH, Megan hopes to improve her technical skills to be the best technician she can be. She wants to learn everything and anything she can. Megan has always been a cat person, although she loves dogs, too. She is definitely drawn towards black Labradors. While growing up, her family always joked with her that she would be the crazy cat lady. True to form, she has 2 cats, 6 year old “Dee” and 3 legged “Moose”, both adopted from shelters.